A portacath is an implanted venous access device for patients who need frequent or continuous administration of medications or other infusions. 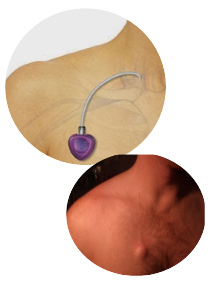 The port sits in the chest wall (similar to a pacemaker) and may remain “insitu” for many months. Your port can be used for taking blood and CT scans involving injection of contrast. Once your treatment is complete and you no longer require the port it can be removed. The procedure can take between 30-60 mins. You will need to present to the Day Procedure Unit on the day of your appointment – your admission time will be sent to you with your appointment time. This will allow the nurses time to complete your admission paperwork and any other tests that may be required such as blood tests or pre-medication. You will be required to change into a hospital gown; you may leave your underwear on. A cannula will be inserted into one of the veins in your arm or hand so medication can be given before, during or after your procedure. You will be taken into the Angiography Suite and positioned on the table. Monitoring equipment will be attached so the nurses can monitor your heart rate and oxygen saturations throughout the procedure. A combination of Ultrasound and Fluoroscopy will be used throughout the procedure to safely and accurately insert the port. A cold antiseptic solution will be used to clean the neck and chest on the side of insertion. Sterile drapes will be used to cover you leaving only the insertion site uncovered. Intravenous sedation will be given through the drip throughout the procedure. Local anaesthetic will be injected into the skin and will sting for 15-20 seconds. You should only feel pushing and pressure after this. Absorbable sutures are used to close the wound – you do not have to have these removed. Once the procedure is finished the port is ready for use, if you are commencing treatment in the following 2 days, the access needle can be left in. A waterproof dressing is applied to the puncture sites. During your time in the recovery room the nurses will monitor your blood pressure and heart rate and regularly check the puncture site for any signs of bleeding. You will be given something to eat and drink. Your cannula will be removed just before you leave the hospital. If you are staying overnight in the hospital, you will be taken to the ward after a short period in recovery. If you are being discharged home, your recovery period is approximately 2-3 hours. You must have someone to collect you and stay with you overnight. You will be given a letter from the nurses with some discharge instructions and any other relevant information related to your procedure. You may be required make a follow-up appointment with Dr Vrazas. This can be made at your convenience by phoning MIVIR on 9411 7165.